Explores the central role of Jewish patrons as shapers of Viennese modernism. Robert Nemes, ed. ; Daniel Unowsky, ed. 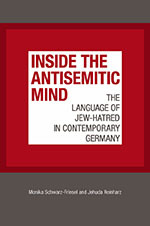 Explores local incidents of antisemitism and antisemitic violence across Europe in the late nineteenth and early twentieth centuries. ChaeRan Y. Freeze, ed. ; Jay M. Harris, ed. An astounding compilation of primary source documents dealing with all aspects of Jewish daily life in the Russian empire. Unearths the roots of a national awakening among Soviet Jews during World War II and its aftermath. A lively look at how coffee affected Jewish life in early modern Germany. Reveals the untold tale of shocking events and anomalous figures in the history of Hasidism. Walter Laqueur has been writing and teaching for over six decades, primarily in the fields of twentieth- century history and politics. In this engaging memoir, Laqueur focuses on the political and historical events that have shaped his thinking and inspired his intellectual work. An exhaustive study of how Jews imagined the idea of Europe and how it existed in their collective memory from the Enlightenment to the present. From 1912 to 1914, S. An-sky and the photographer Solomon Iudovin gathered materials and took photographs of Jewish daily life in pre-Revolutionary Russia’s Pale of Settlement. Photographing the Jewish Nation offers English-language readers their first look at over 170 extraordinary, recently rediscovered photographs from their expeditions. Ivan Davidson Kalmar and Derek Penslar, eds. "The essays in this highly original work take the relationship of the Jews to Orientalism in unexpected directions, thus demanding a thoroughgoing revision of Orientalism itself." "Through the meticulous analysis of a single wooden synagogue, he opens before us the nearly undocumented pre-Hasidic popular culture of Eastern European Jews." The first thorough account of South African Jewish religious, political and educational institutions in relation to the apartheid regime. "Fascinating and very well written, this outstanding book advances our understanding of the history of the Jewish family by a quantum leap." "Laqueur has undertaken the daunting task of writing the collective biography of a generation unique in history: the children of the German-Jewish families who fled Germany in the 1930s . . . As someone who shared this experience, I can testify that Laqueur has succeeded admirably." An eminent social historian examines the rise and transformation of Jewish communal leadership in Central Europe. His story of fragmentation and polarization sheds light on the tensions within the Jewish community as it struggled to respond to modernization. Jeffery Shandler and Beth S. Wegner, eds. Barbara Kirshenblatt-Gimblett, Arthur A. Goren and the editors examine American tourism and travel to pre-state Israel, representations of the holy land in exhibitions and world fairs, and the symbols and public culture of American Zionism. Examines Polish and Jewish perceptions of the rapprochement culminating in Polish national insurrection against Czarist Russia in 1863. Yisrael Gutman, Ezra Mendelsohn, Jehuda Reinharz and Chone Shmeruk, eds. Original essays by distinguished scholars on all aspects of Jewish life in Poland from 1918 to 1939. Focusing primarily on the Bene Israel and Baghdadis in the late 19th and 20th centuries, Joan Roland describes how identities begun under the Indian caste system changed with British colonial rule, and then how the struggle for Indian independence and the establishment of a Jewish homeland raised even further questions. "Essential reading for anyone who wishes to understand the contemporary Jewish condition in a world still ridden with anti-Semitism." Richard Wagner’s antisemitism considered in the context of his time, place and aspirations rather than in relation to his later appropriation by the Nazis. Frances Malino and Bernard Wasserstein, eds. "Specialists in both French and Jewish history will welcome this important collection . . . Most valuable is the essays’ integration of Jewish history within the larger sweep of French history." "A splendid book for comprehending human kind."